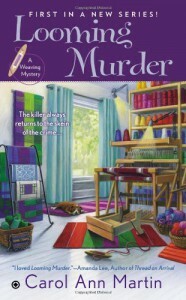 This is the first in the Weaving mystery series. The main character, Della, has left the corporate world after she caught her boss embezzling and was almost falsely implicated herself. In the aftermath she decided to follow her dream of opening a weaving shop. The mystery itself is solid. There are a number of suspects with good motives and I never suspected the person who was the ultimate culprit. Della's new friends are fleshed out and likable. I am looking forward to visiting them again and again. The small town setting was very friendly and cozy. There was just the whole Matthew issue that detracted from the story. I have already read the second book and I can attest that it gets better as it goes along, but it did take away from the story in this installment. In an overly complicated plot point, Della and her friend Matthew have decided to trade homes and Della steps up shop in Matthew's house. When the store has only been open a week or two, Matthew suddenly decides he wants his house back and Della has to find another place to live and open her business. This part of the story really bothered me. I would imagine that Della had to print business materials, do advertising, etc all with the old address and now after just a couple of weeks she has to move? Why would she set up a business without a longer term lease? Also, she acts like it's hunky-dory for Matthew to just move back and isn't mad at him. If someone did that to me, I'd be furious and would tell them so. Once Matthew comes back he continues to act like a putz and is extremely unlikable. He is being set up as a possible future love interest for Della, but I can't help but hope that she gets over him and find someone better. He is very moody, snaps at her a lot, and just generally talks down to her. I hope Della can find someone that treats her with more respect.